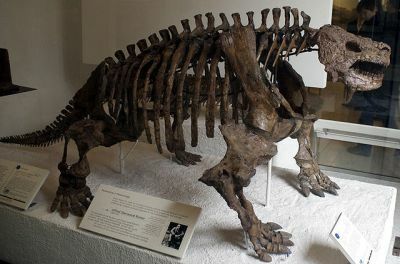 Shansisaurus xuecunensis, from the Shihezi Formation of Henan, differs only in possession of a more robust humerus, which is not enough to justify taxonomy separation; Huanghesaurus liuliensis known from a lowre jaw and partial skeleton would be another synonym. (Lucas 2001). Honania complicidentata and Tsiyania simplicidentata Young, 1979, also from this locality, are based on isolated teeth and probably invalid taxa, or synonyms of S. permica. Lee 1997 refers to S. xuecunensis as a metaspecies lacking the autapomorphies of Shihtienfenia. Tsuji & Müller 2009 seem to consider it a valid taxon for cladistic analysis, and like Lee 1997 place the two Chinese species close to Pareiasuchus. The skull (left) is very broad, flat, and strongly sculptured, and bears bony protuberances in the jugal (cheek) and rear regions. As with some species of Pareiasaurus, with which it is clearly related, the quadrato-jugal or cheekbones extend outwards and forwards, makings an angle of about 120o with the maxillary border. Comments:  This very large pareiasaur occurs at a later time than Deltavjatia vjatkensis. Originally known from several skeletons found together in a flood channel sand deposit, it is a common and widespread index taxon. It is an advanced form with upright limb posture, this being an adaptation for supporting the weight of the body (Cox et al 1988) although it has also been interpreted as semi-aquatic (e.g. Golubev 2000 p.S221) (and hence presumably sprawling). The skin is heavily armoured with osteoderms.